And so ends yet another read-a-thon. 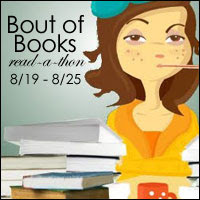 Bout of Books 8.0 officially ended Sunday at midnight. After 7 long days I'd have to say I'm fairly pleased with how I did. Although I didn't finish all the books I had included in my TBR at the start I was still able to read well over 150 pages a day. My original goal of 150 pages for Monday to Thursday and then 250 pages Friday to Sunday would have totalled 1350 pages, only 90 pages more than what I did accomplish and I picked up a couple other books that I hadn't planned on. Rapture by Lauren Kate: This first book I had started prior to the RAT and then finished during it, banking 268 pages. I gave it 4/5 (though a slightly lesser 4/5 than the 4/5 I gave its predecessor, Passion). I listened to the audiobook by the lovely Justine Eyre. She does such a great job with giving each character a recognizable voice. I listened to it over Monday, Tuesday, Wednesday, and Thursday. Blood Brothers in Louisbourg by Philip Roy: This next book I also started prior to the read-a-thon but dispite a valiant attempt I didn't finish it during the week (Monday, Tuesday & Saturday) as I found its small print was eating up my time & the storyline (so far) wasn't intriguing me enough to want me to read the next page, the next chapter, etc. I hope to finish it sometime soon though when I get more time to devote to it. I had such high hopes for this book. I banked 48 pages with this book. Hard Run by Tsugumi Ohba: The first book I picked up and began once the read-a-thon started was this next book. I also finished in completely on Monday, banking 193 pages and giving it 4/5 as I continue with the Death Note series of graphic novels. 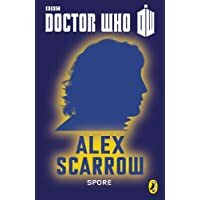 Spore by Alex Scarrow: On Saturday I also bought/downloaded this short story which is #8 in the Doctor Who E-Shorts series which are released one per month on the 23rd and are each based on a reincarnation of The Doctor from the first (William Hartnell) to the eleventh (Matt Smith) by well-known children's authors. This one was thus based on the Eighth reincarnation played by Paul McGann, whom was only seen in Doctor Who the movie in 1996 however there are several books that depict more of his adventures. This e-short banked 40 pages towards my total and I gave it 4/5 stars. My most anticipated ebook in this series will be that of the tenth doctor, David Tennant, which will be released this October. Love by Tsugumi Ohba: After such an emotional and thought prevoking book like Left Neglected I needed something fun to keep my reading going. That's where this book came in, the fourth in the Death Note series of graphic novels. I picked it up on Saturday and finished it the next day, banking 204 pages and giving it also a 4/5 as this one came out with some pretty funny lines that had me laughing out loud at times. Just what I needed. The Raven Boys by Maggie Stiefvater: By Saturday I realized I was missing out on adding to my page counts because I no longer had an audiobook on the go. Time when I was merely driving back and forth to work, and cooking and eating dinner were time being wasted as I was unable to read/hold a physical book at the same time. So I started this one. I love Maggie Stiefvater's books in audio as they always include some music at the beginning and end that she composed and performed herself. I also figured, since I also had a hardcopy of this book, that I could switch back and forth between the two mediums based on the situation. This was enjoyable but I found I was often relistening to sections of the book I had physically read just to read had the narrator said and name or how a new character's accent came across. I am still making my way through this book/audiobook but banked 185 pages of it during the RAT (Saturday and Sunday). Let me know how you did if you participated in this read-a-thon, if you've read any of these books and would like to share your opinion (spoiler-free) on them, or if you have anything else you'd like to share! Day Five of seven sure didn't go as planned. For a day without work I read even less than usual. Oh dear. I didn't start a new audiobook so times where I am usually driving someplace, cooking food, or eating were filled with quiet contemplation or a tv show versus get more pages read/listened to (mainly due to my ipod dying and my charge cord choosing this time to be MIA). My day also included playing Second Life for longer than I should have last night and then sleeping in late & then taking a lengthy nap later on. I did however read some more of Left Neglected and bought and read this month's Doctor Who e-short and my overall average is now at 153 pages per day (compared to my goal of 150 pages per day) so that's not too bad even if I'd love that to be a lot higher. So after a fairly successful first day, my reading took a steep decline. Where I usually would listen to my audiobook both to and from work in my car, I only listened to it for one direction as I gave a co-worker a lift and didn't want to subject them to 15-ish minutes of the middle of the last book in a series they haven't read after working an 8.5 hour shift. Then I spent longer than expected in Walmart picking out a new microwave and tv for my new house/apartment. Lastly tonight was the last ceilidh of the season in my community so I went and watched that during the time I'd usually be reading. I also felt pressure to read more pages so I started another book (at 11:30pm) as Blood Brothers in Louisbourg, dispite being quite short, has a small font so it is taking me awhile to get through. Day One for me is now officially over. I only managed to read 7 pages at midnight before falling asleep then worked from 8-4:30pm so this left me with the rest of the night to do my reading. So let's see how I did. The last read-a-thon(RAT) I participated in (The BookTube-A-Thon) challenged us to read 300 pages per day for each of the seven days. I ended up reading an average of 244 pages per day. This was a week where I could devote every moment (when I wasn't working or sleeping) to reading. This coming week I still have my work and sleep commitments but I also need to be packing for my upcoming move. So that being factored in I am making my goal to read 190 pages per day. This will hopefully give me the opportunity to complete all my planned books and, if I have extra time, choose based on mood another later on. The Bout of Books RAT is all about reading more than you usually do and may include challenges along the way but (as far as I can tell) doesn't include a set of challenges to direct your book choosing as my previous one did. As I have so many books I want to read (all at once if I could lol) I enjoyed having the framework and structure those challenges gave to narrowing down my choices. Therefore I've looked elsewhere to give me structure, Goodreads (particularly the Nothing but Reading Challenges group). I had already committed (at least in my own mind) to tackling the Reading University Challenge. I am currently on the Associate's degree level so I decided to choose my books for this RAT in order to work towards fulfilling that challenge's criteria (and to give myself a bit more diversity in the genres I choose) plus reading a couple books that are still left over from my TBR from the last RAT (oops).